Recently Fly Mobiles has launched 3 Android phones and an Android tablet in India which we have covered earlier and were busy reviewing this device. 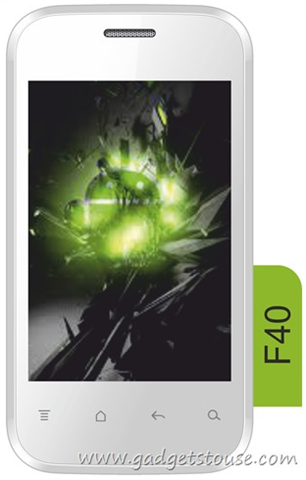 Out of these devices launched, Fly F40 is the smallest and the cheapest device for the company. Also this is the device which will be coming with the lower android version as compare to the other device launched but with this the company proves that it want to provide option to the user with all budget ranges. The devices launched by Fly seems to be intended to challenge the Indian Mobile manufacturer and this F40 can provide a good competition to the Micromax low budget device.We will be here comparing this F40 with one of the Micromax popular low budget device A45 which is bit costly compared to F40. Both this device operates on same Android version (Android 2.3 Gingerbread) and have a minute difference in the body size. The Fly 40 is bigger and slim with dimension of 125.5 X 66 X 12.25 mm when compared with Micromax A45’s dimension of 115 X 63 X 13 mm. The display size also don’t have a much difference as F40 sports 3.78 inches on screen and Micromax A45 sports 3.5 inches of display. Both device got the operating frequency of GSM 900 / 1800 MHz but the big difference we see here is F40 is a dual SIM device and hence can benefit the user by allowing them to use two SIM simultaneously where as Micromax A45 got a single SIM slot. The F40 also got the better camera resolution with 3.2 rear camera and 0.3 VGA front camera where as the Micromax’s device got 2 MP camera without the secondary front facing camera.Moreover the battery is also higher with 1400mAH power when compared to A45’s 1300mAH powered battery. F40 seems to be a clear winner in this comparison and also it will be coming around Rs.1000 less compared to Micromax A45. The technical specs of this device looks really impressive and can be said worth for the price tag of Rs.4,500 INR. The device ensure User a great touch experience, better sound quality, fast processing speed and multiple applications which is really value for their money. The pre-installed applications like Facebook, Nimbuzz, YouTube and Opera will be an additional package to the user which can really meet there social media demands. The device will be available soon in the market and for the online order with the price tag of Rs.4,500 INR. Heyyy, u hav mentioned it has 1 GB RAM,bt, other techno site says it has 256MB RAM. we have checked its 256MB – thanks for pointing out, its corrected now.